What’s hot in the kitchen? As the autumn/winter 2017 trends hit the store, we’re covering a highlights that we’ve spotted. 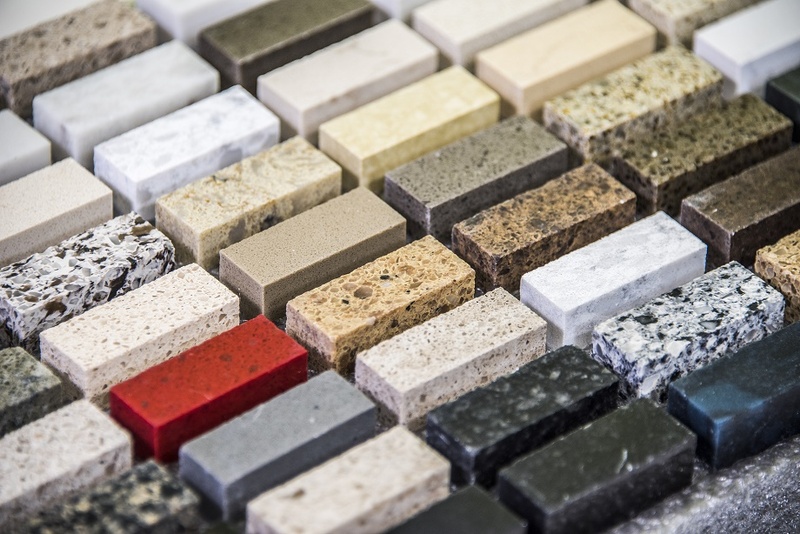 At Surrey Marble and Granite we offer a wide range of stones, from natural marble and granite to processed stone and engineered quartz. As we are a full-service company, doing everything from helping customers select a stone through templating and manufacturing to installation, we get a glimpse of some of the most fabulous home kitchens across the south of England. Here are a few hot trends you might want to consider if you’re thinking of investing in replacement worktops. From Arena Stone to Quarella, quartz worktops are really making a splash this year. We’ve been fans for a while now, and it’s great to see them getting some love. Quartz is one of the toughest materials on the planet, and quartz worktops rival granite for durability. They’re waterproof, heatproof, stainproof and hard to chip or scratch. They’re also available in a fantastic range of colours and textures from natural pebble shades to daffodil yellow and lime green. There are far more than 50 shades of black, white and, yes, grey, in this colour palette. There are so many interpretations of this trend, from creamy country kitchens to Nordic-inspired noir. Simple colour choices give a classic back drop that’s easy to update with splashes of on-trend colour. If you love to redecorate, this may be the look for you. Swap your winter reds for spring greens then move on to tropical summer shades before sliding back into autumnal browns – and all by changing tea towels, vases, and other small items! Many UK kitchens are compact, particularly when compared to the sprawling lofts in design magazines. Our customers have come up with all sorts of clever ways of making the most of their space, from using an overhang to make a breakfast bar / worktop to fitting sliding drawers under their cabinets. Our team are happy to help by cutting replacement worktops into unusual shapes and we’ve even had requests to use the offcuts to make matching shelves or windowsill covers. This is a great look for many British period buildings as it turns exposed brickwork, concrete and wood into a stylish design feature. You don’t have to live in a repurposed mill to get the look though – using materials such as stone and wood will let you recreate the look even in a brand-new semi. We’ve seen some very effective home kitchens use granite and quartz replacement worktops to develop a fashionable industrial look. If you’re happy with the layout of your kitchen, why replace perfectly good cabinets or appliances? We’ve seen lots of savvy customers selecting their own replacement worktops and cabinet doors, dramatically reducing the cost of their kitchen remodel. By keeping the bits which work well, they’re able to focus their spending on the areas they want to change, giving them more money for a touch of luxury where it counts. The new spirit in interior design spreads all around the home, to include not only beloved areas for renovations such as the living room and the bedroom, but also the kitchen. Kitchens are spaces where a lot of time is spent by all family members, so innovations in interior design such as granite worktops are more than welcome – it lends not only appeal but comfort and convenience with its characteristics which conform to the needs of modern home environments.